Reminiscence of the Future... : There Is Always A Price To Be Paid. We have been over this in this blog several times. It is good to repeat it yet again. DUBAI (Reuters) - IranAir is looking to buy planes from any company not requiring U.S. sales permits and may consider Russia's Sukhoi Superjet 100, the flag carrier's head was quoted as saying, as Iran tries to renew its aging fleet despite facing U.S. sanctions... IranAir had ordered 200 passenger aircraft - 100 from Airbus, 80 from Boeing and 20 from Franco-Italian turboprop maker ATR. All the deals were dependent on U.S. licenses because of the heavy use of American parts in commercial planes. Big power politics does not work on mere trade contracts, however important they are. The European Union, China and Russia backed a mechanism to allow “legitimate” business to continue with Iran, a plan aimed at sidestepping American sanctions and allowing international trade to continue unimpeded as President Donald Trump pursues his "America First" agenda. The push for such a channel, announced by EU foreign affairs chief Federica Mogherini in New York late on Monday, reflects growing calls in countries such as France and Germany for the EU to adopt tools that will allow it to pursue its foreign-policy goals with less recourse to an unpredictable U.S. ally. A chief catalyst was Trump’s decision to withdraw from the Iran nuclear deal even as world powers urged the U.S. to stick to its mandate. 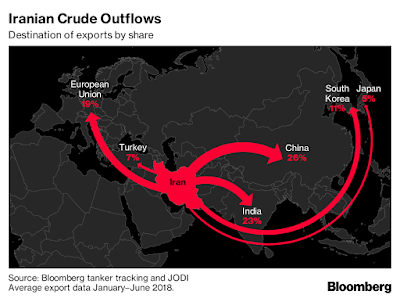 As you can see, if push comes to shove--new "instruments" or not, the United States can "kill off" Iran's deliveries to Europe and Asia easily. I do not have any faith with EU, which, I think, can be forced to do US bidding, especially when one talks about "defense" issue, which are important to Europeans (after all, aggressive Russkies are planning to harm Europe for...no apparent reason). This could be a disaster for Iran but... enter Russia. First, the reason Iran is still not bombed, as many in Tel Aviv (and D.C.) sleep and (wet) dream about, is because of, no, not China, but Russia. After all, even Iranian assets in Syria are breathing much easier as member of Knesset's Committee on Foreign Policy and Defense Xenia Svetlova (obviously of Russian Jewish descent) admitted today (in Russian). Since Russia supplied S-300s to Syria, Israel didn't fly a single mission into this country and this delivery changed the balance of power in region. Isn't it what I preach for years now? How many more empirical evidences are needed before people start to take in basic facts of great power behavior. Especially if this great power (or superpower) is Russia who loves peace and quiet. Iran, sure as hell, now better start thinking very clearly regarding her trade relations with Russia, because it is her who is selling this most important and desperately desirable product in the world--political stability. Hence the question: can Iran be slightly more patient for Russians finishing SSJ-100s to fully Russian specs, same goes to MC-21, which goes into series production next year, and so on? There is, after all, another dimension to this whole regional dynamics once one considers that almost 40% of Iranian population are ethnic Azerbaijanis and that brings into focus the issue of Caucasus and Turkey, which herself is somewhat in limbo right now, albeit I expect her to fall back into the NATO fold eventually. In the end, Iranian oil deliveries also rest on arrangements which Russia, who doesn't really gives a damn about sanctions, will make. So, no matter how important for Iran her regional ambitions are, she will have, at least for a little while, to dance a little bit to Russian tune, whose music sheet ranges from trade to military assistance to the alternative to SWIFT which eventually will be killed by the US, to...well, guarantees of Iran's safety which is a direct function of Russia's military might and geopolitical weight. It is what it is and for the time of this great turbulence, Iran will have to do a slight accommodation with Russia who is sincerely interested in keeping Iran stable, prosperous and peaceful. In the end, it was Iran who, once sanctions have been lifted, immediately signed contracts for 200 commercial aircraft NOT with Russia, who at that time hoped that Iran will consider Russia's support. But, as they say in Russia the orient is a very delicate business. It looks like Russians finally learned their lessons and that is what matters most at this point of time.